I had to sit down and read volume five in the Childcraft encyclopedias I’m reviewing. I haven’t recognized a single story yet. Perhaps I didn’t read them or wasn’t enamored of them as I was the earlier volumes. Many of the stories in this volume were originally published in Child Life magazine which was published from 1921 to 1997 and was aimed at children ages nine to 11. Child Life has been incorporated into Children’s Digest. That magazine might also be out of print now. I hope the children’s magazine industry isn’t suffering too badly during this recession and era of electronic games. I was thrilled to get The Horn Book Magazine delivered just for me. Dad would get all his horse magazines, Mom all hers with pictures of food and the Lennon sisters, and I’d get my own magazine, too. Our library carried Highlights for Children, but my magazine was just for me. I’ve learned that John Newbery published one of the first children’s magazines, The Lilliputian. A photo of an issue up for auction shows that it was also known as “the young gentleman and lady’s golden library. Being an attempt to mend the world, to render the society of man more amiable, and to establish the plainness, simplicity, virtue and wisdom of the golden age, so much celebrated by the poets and historians.” An attempt to mend the world? As a child I just wanted to be entertained and maybe learn something if it was interesting. The first American children’s periodical, Children’s Magazine, was published in 1789. I wonder how large its circulation was. The entire count for the country was still under three million. The publication ceased within a year. 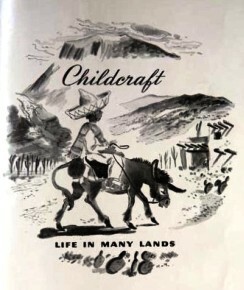 Another source of stories in this volume of Childcraft was The Junior Red Cross News. It was the first of several Red Cross publications for young people and appeared in 1919. It lasted at least until the 1950s. There is one story about a black child in this volume. It’s a tale of a North African (Algerian) boy who proves his honesty and is rewarded by American GIs. Hussein, the young shepherd in “Eggs for Sale,” has learned enough English to say “Tank you veddy mooch.” The story is in the final section, “Stories of Many Lands,” and doesn’t say as much about Algeria as it does about how Americans think others should see us. I suspect that the editors felt that they were being very inclusive, and maybe they were for the the 1940s. Other stories from many lands are about children from Dalmatia (part of Croatia), Hungary, Greece, France, Lithuania, China and Bora Bora. The section on “Children of the Americas” covers more than just kids from Appalachia and Indiana. There’s a story about an Argentinian child, and two from Canadian provinces. 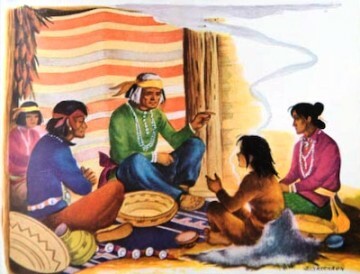 There’s even a story about a Yaqui Indian and another about a Texan. This is where a Laura Ingalls Wilder story appears, too. My favorite story is about two girls who get so engrossed in their library books that they don’t notice when the library closes and they are locked inside. That’s such a great fantasy. I would have immediately ventured into the section of the library directly behind the librarian’s desk and snooped around. And then I would have gone through the librarian’s desk, which is something Garnet and Citronella, the girls in the story, did. The story, “Locked In” is part of a larger book by Elizabeth Enright: Thimble Summer, a Newbery Medal winner set in a small Wisconsin town during the Great Depression. I guess I just prefer stories set close to home. These stories provide a good window into what the general culture thought children should learn. 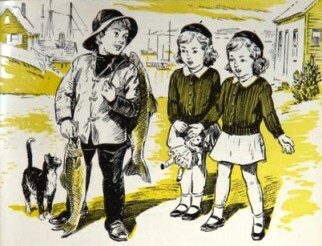 The stories generally feature polite, honest, generous, thrifty, and industrious children. And the boys are also courageous. “Locked In” was the only story I noticed that encouraged children acting in their own self-interests. Current children’s literature themes include celebrating differences, dealing with teasing, staying safe (no illustrations of children riding in a truck bed), dealing with trauma, going after your dreams, the environment, powerful girls and such. However you’ll still find themes like friendship, responsibility, honesty, etc. I think there’s good reason most of the stories in this volume are no longer seen on bookstore shelves. I think I might have to find a copy of Thimble Summer, however. I remember the set of orange-covered Childcraft books from the early 60’s and wish some family member had kept it. 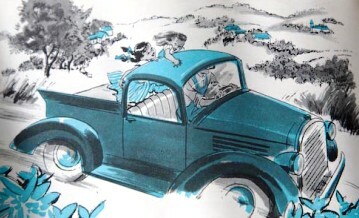 Especially remembered are the illustrations to Longfellow and the Highwaymen poem, scary at that time. But my favorite was Christmas on Beacon Hill, which I’m trying to find somewhere again. I’m 59 now so this reading would have been over 50 years ago! I guess that’s what happens to memory around the holidays.